View of Ottawa from McKenzie King Bridge. 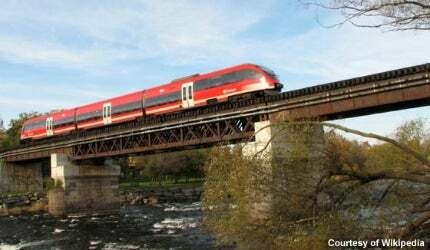 The O-Train over Rideau River. The existing light rail line utilises three Bombardier Talent DMU trains. Line 1 connects Greenboro to Bayview through Carling, Carleton and Confederation. Bayview station, a terminal station of line 1. The Ottawa light transit system (OLTS) is a pilot light rail transit (LRT) project underway in the capital city of Canada. The OLTS, also known as the O-Train, is currently operating with a single line. The OLTS is operated by Ottawa’s OC Transpo under the name of Capital Railway. The first line of the OLTS began operations in October 2001. An extension project involving the construction of the second line is currently underway. Construction work is expected to begin in spring 2013 and expected to be completed by 2017 at the latest. Ottawa, Canada’s capital, had a population of about 812,129 in 2006. Bus transit systems operated by OC Transpo form the major public transportation system in Ottawa. Other public transportation systems include regular buses travelling on fixed routes in mixed traffic, and door-to-door bus services for the disabled. The LRT system was chosen as it is flexible and provides a faster, more efficient, environmentally friendly transit system for Ottawa. The Ottawa LRT project was initiated in August 1998, with the move made to develop and implement the project by the then administrative body. "The Canadian Government plans to increase public transit use to 30% by 2031." During 1998-99, the environmental assessment study was conducted, and in September 1999 the project was approved by the city council. An agreement was made between the city council and Canadian Pacific Railway for the development of line 1. The extension of the system, which involved the construction of another line, dates back to July 2006. The execution of the expansion project was, however, delayed due to various controversies related to line routes. Ottawa’s transportation master plan (TMP), which incorporates the development of the city’s transit system by 2031, includes the plan to extend the Ottawa LRT. The expansion project came into significant focus again when the TMP was adopted by the city council in November 2008. In May 2009, the desirable corridor was selected and approved by the city council. The corridor was selected considering the set of rules developed for a grade-separated LRT system. The selected route connects Tunney’s Pasture and Blair. The first phase of the project involved the construction of line 1, including the building of railway stations and passing tracks as the fleet runs on the existing Canadian Pacific Railway track. The passing tracks were laid for operating trains in both directions. The construction of line 1 started in 2000 and opened to the public in 2001. The line cost $21m to construct. The extension project developed as part of the TMP involves building a new grade-separated rail transit system for Ottawa. It also involves the construction of the Downtown Ottawa Transit Tunnel (DOTT). The system should be capable of running on a track shared by roadways and grade separated track. It is an east-westbound line and its construction will be carried out on the pre-existing transitway. "The OLTS is considered to be Ottawa’s largest ever light rail transit infrastructure." OLTS is considered to be the city’s largest ever transit infrastructure and is part of the government’s plan to increase public transit use to 30% by 2031. The construction work on line 2 involves the construction of a light rail line, which includes a 3.2km-long downtown tunnel. Ottawa LRT will comprise two electric tracks powered by two AC motors each, a non-powered centre truck and a wide range of braking systems, including air, magnetic and dynamic systems. The estimated cost of extension project is around $2.1bn. Of this, $561m will be funded by the Ontario Government, with the remaining funded by federal and city governments. In December 2012, the City Council in Canada gave approval for construction of the 12.5km OLRTS. Construction on the OLRTS is expected to begin in spring 2013. OC Transpo will provide a name to the line once the construction is completed and operation is started. The initial phase will include construction of 12.5km of guideway, and three underground and 10 above ground stations. It also includes construction of a 2.5km tunnel, widening the Highway 417, and construction of a maintenance and storage facility. The construction is expected to be completed by 2017 and the line will be opened for operations by 2018. In December 2012 Rideau Transit Group consortium, which comprises of ACS Infrastructure, SNC-Lavalin and EllisDon, was awarded €1.5bn ($2.1bn) contract to design, build, finance, and maintain the confederation line. The existing light rail line utilises three Bombardier Talent diesel multiple unit (DMU) trains with three cars each. Built in Germany, they were later shipped to Canada in 2001. Each train has 135 seats and space for 150 standees. Of the entire fleet, two will be in service at any given time. "The Ontario Government will fund $561m, with the remaining provided by federal and city governments." The locomotives integrated are Bombardier’s BR643, powered by diesel. The front and rear cars of the fleet are powered while the car in the middle will be pulled along. The locomotives’ emergency features include door release and fire extinguishers. The Bombardier Talent DMUs are being used for the first time in a North American transit system. Bombardier is also engaged in maintaining the fleet of the OLTS. Line 1 also operates other trains and serves Ottawa Central in facilitating freight service to the National Research Council. In February 2013 Alstom was awarded with a contract valued at €400m ($297.84m) to supply 30 rail vehicles for the confederation line. The contract also includes providing maintenance services for 30 years. Edmonton Light Rail Transit (LRT) system is a pilot light rail transit network in Edmonton in Alberta, Canada. The OLTS system makes use of an automatic block signal (ABS) system. The recently renovated systems are fixed at other locations to provide efficient signal communication to trains. The station platforms are equipped with CCTV cameras and patrolled by OC Transpo law enforcement officers. In addition, yellow emergency callboxes are integrated in the stations and used to contact the OC Transpo employee. Payphones with a free auto-dial button, connecting the commuters to the security, are also located in the station. Trains are fitted with intercoms to communicate with the train operator in case of emergency, such as passenger illness or a disturbance.